Two Catholic civilians were killed in separate Loyalist paramilitary attacks in Belfast and Armagh. Bobby Sands Elected to Westminster In the Fermanagh / South Tyrone by-election Bobby Sands, then on hunger strike in the Maze Prison, was elected (following the final count on 11 April 1981) as Member of Parliament for the constituency. The turnout for the contest was 86.9 per cent and Sands obtained 30,492 votes and Harry West, the Unionist candidate, obtained 29,046 votes. See: UDR – Ballydugan Four – Lest We Forget! A Catholic man from north Belfast was shot and wounded by Loyalist paramilitaries in Newtownabbey near Belfast. 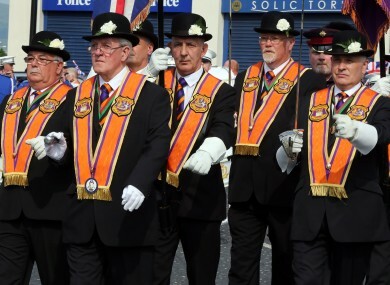 The Orange Order held a second meeting in County Antrim to discuss the compromise that had been negotiated by Mediation Network on marches in Dunloy. The meeting ended with the Orangemen rejecting all attempts at mediation. Brendan McAllister, then Director of Mediation Network, warned that a “Bosnia-style” conflict could develop over the issue of parades. John Bruton, then Taoiseach (Irish Prime Minister), called on Nationalists in Northern Ireland not to vote for Sinn Féin (SF) in the forthcoming general election. Bruton said that a vote for SF would be a “vote for murder”. At the parliament building in Stormont, Belfast, the multi-party talks continued all day and extended beyond the designated 12 midnight deadline. At 6pm David Trimble, then leader of the Ulster Unionist Party (UUP), held a meeting to brief the UUP Executive which gave him its support. At 11pm there were angry exchanges between Loyalists in favour, and those against, the talks, as Ian Paisley, then leader of the Democratic Unionist Party (DUP), led a march to the buildings in protest against the negotiations. Jeffery Donaldson, who had been a member of the Ulster Unionist Party (UUP) talks team left Stormont without comment amid rumours of a further split in the UUP over the proposed agreement. Loyalist paramilitaries carried out a pipe-bomb attack on a public house in County Antrim. One man was injured in the attack. The Irish government announced that six Irish Republican Army (IRA) prisoners would be granted early release. Among the prisoners named were them members of the Balcombe Street seige gang. Mitchel McLaughlin, then Sinn Féin (SF) chairman, said that the two governments should defend the Good Friday Agreement and stated that his party would be adopting that approach in the coming week. Despite the fact that several Ulster Unionist Party (UUP) Assembly members had expressed reservations about the Hillsborough Declaration the UUP Assembly team later accepted the declaration as a basis for negotiation. Tuesday 9 May 2000 Closure of Security Bases Ronnie Flanagan, then Chief Constable of the Royal Ulster Constabulary (RUC), disclosed that five military installations were to close. Died ten weeks after being shot by sniper while on British Army (BA) foot patrol, North Street, Lurgan, County Armagh. He was injured on 26 January 1973. Shot while moving arms from car outside house, Culdee Terrace, Armagh. Commanding Officer. Shot at his home, near Otterburn British Army (BA) base, Northumberland, England. Manager of Andersonstown Social Club. Shot while in club premises, off South Link, Andersonstown, Belfast. Killed in bomb attack on Lenny’s Bar, Railway Street, Armagh. Found shot, Collin Glen, Hannahstown, near Belfast. Alleged informer. Off duty. Killed by booby trap bomb attached to his car, in car park off High Street, Omagh, County Tyrone. Shot at his mobile home, Aughaveagh Road, Coagh, County Tyrone.